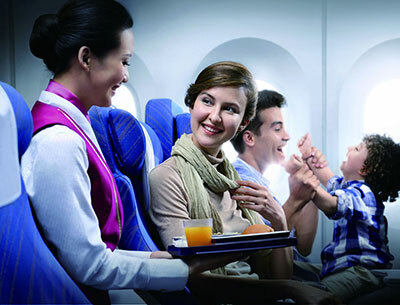 With a revamped, comfortable flying experience, over 600 hours of in-flight entertainment and a fusion of East Asian and Western cuisine available onboard, there are few better ways to kick-start your holiday than travelling with China Southern Airlines. 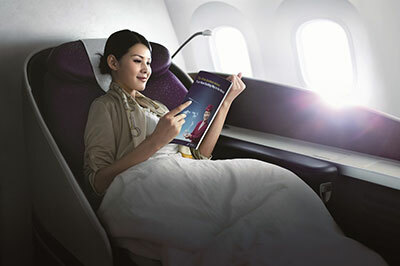 Explore China, Asia, Europe, North America, Oceania and beyond with this award-winning carrier, lauded by Skytrax for being the ‘Most Improved Airline Worldwide’. Established in 1988, China Southern Airlines has grown to become the largest airline in Asia and the third largest airline in the world in terms of passengers carried. The airline has hubs in Guangzhou and Beijing, and flies to over 190 destinations with its impressive fleet of over 650 aircraft. China Southern Airlines has a 4 star rating from Skytrax and offers flights from London Heathrow onboard its 787 Dreamliner. China Southern's long-haul flights from the UK feature comfortable seating in Economy Class that includes adjustable seat headrests as well as an adjustable seat cushion and backrest. Dining onboard involves a selection of East Asian and Western cuisine ensuring something to suit everyone. Dishes range from Cantonese-style ‘kung-fur’ soup to spaghetti with chicken. Special meals such as Kosher or vegetarian can also be requested. Business Class passengers can stretch out and relax in a 62cm wide fully flat bed. 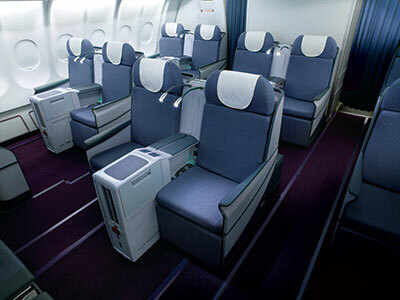 The Business Class cabin also has a 1-2-1 configuration, allowing every seat direct aisle access. Seats sitting adjacent also feature privacy dividers while all seats feature a literature pocket, reading light, USB port, magazine rack, in-seat power supply and 15-inch flat-screen LCD TVS. China Southern offers meticulously prepared Chinese and Western dishes featuring authentic flavours and local ingredients. When flying from Guangzhou guests will be treated to some of the airlines’ most celebrated dishes such as China Southern Airlines’ beef ‘big bowl’ noodles. The airline also offers an ‘In-flight Cellar’ and ‘In-flight Tea Garden’ service allowing you to sample the finest alcoholic beverages and China’s traditional tea culture respectively. For the ultimate in service, comfort and privacy, China Southern Airline’s features a collection of private flat-bed First Class suites. Offering incredible space and privacy, the private suites are 2.08m wide and 1.52m high, and feature adjustable power-seats that can convert into a flatbed measuring 2m long and 83cm wide. Within the private cabin you can choose from six different lighting scenes and enjoy entertainment on a 23-inch flat-screen LCD TV. First Class passengers on China Southern experience the ultimate in entertainment as well. Large personal TV screens are found in each private suite and noise cancelling headsets complete the experience with high quality sound. Guests may also use their laptops and tablets and other electronic devices thanks to USB ports and power points at each seat. The finest meals inspired and prepared by chefs are found on an impressive First Class menu. Cabin staff individually plate each course and serve meals on linen covered tables. Passengers can even dine with a guest if they choose as each suite can accommodate a meal companion. Carry-on bags are limited to 5kg. First Class passengers are permitted 2 bags at 5kg each while Business and Economy are restricted to 1 bag. Each item of cabin baggage must not exceed total dimensions of 115cm when adding length, width and height. The checked baggage allowance depends on class flown, fare type and destination. For specific information, check with your Flight Centre Travel Consultant as there may be variances between countries. The below is a general guide only. The maximum weight of each bag is 32kg for all destinations except the U.S. and Canada. North American destinations have a maximum weight limit of 45kg. Size limitations are the same for all destinations – 158cm. Some items may be included as part of a passenger’s checked baggage allowance such as golf, ski and fishing equipment provided that items are within size and weight restrictions. Bicycles must be specially packaged with tyres deflated and your Flight Centre Consultant can advise on packing requirements. Animal and pet containers, surfboards and windsurf equipment are charged a flat rate fee and are never included as part of the free baggage allowance. One checked bag up to 10kg is permitted for infants along with a folding pram or stroller. Baggage allowance is given when an infant ticket is purchased at 10% of an adult fare. Dangerous goods are restricted from flying. These items include flammable materials, liquids and gasses as well as explosives, ammunition and all other toxins and poisons which interfere with the safe operation of the aircraft. Some items, such as electric wheelchair batteries may be carried in the cabin if properly packed. Please check with a Flight Centre Consultant for the full list of restricted items. Petrol powered equipment is banned from flying even after fuel has been drained. Check-in at home & spend more time at duty free! There are 2 ways to check in for China Southern international flights – online and at the airport counter. Online check-in is available with the reservation number and an internet connection. Printable boarding passes are issued upon completion of the process. Online check-in is open between 1 and 24 hours before departure. The airport ticket counters are available for check-in and bag drop off from 3 hours before departure. The airline recommends guests to arrive at the counter no later than 90 minutes before departure. Check-in closes 45 minutes prior to departure. China Southern provides up to 20 lounges throughout China for use by its guests flying in First or Business and for elite Sky Pearl Club members as well as those holding elite status with Skyteam affiliated airlines. These spaces are exclusive areas in which to work or relax in a quiet environment and where guests can enjoy a meal and freshen up before a flight. Lounges are located in Guangzhou and Beijing and at hundreds of airports around the world through global alliances with airlines from around the world. There are 3 status levels in the China Southern Sky Pearl Club frequent flyer program – Base, Silver and Gold. Members achieve the next status level when the required number of miles is reached when travelling on China Southern, Skyteam airlines and other alliance member flights.